The Best Way to Ship From Home – Never Go To The Post Office Again! I hate going to the post office. I’m not close to my “home” office and it is highly inconvenient. When I started getting more active on the BST groups on Facebook, I decided I needed to invest the quickest and cheapest option to mail my goodies out rather than having to go to the post office. I also didn’t want to haul a 30+ lb pumpkin seat in with me every time I went. So here is my tutorial on how to ship from home. I use PayPal for everything. There are 2 ways to ship. 1) If you use PayPal’s invoicing system (highly recommended), you can simply select Buy Postage and fill out the form and print. I’ll go into more detail about the form below. 2) If you do not use the PayPal Invoicing system or just need to ship – go to Ship Now. 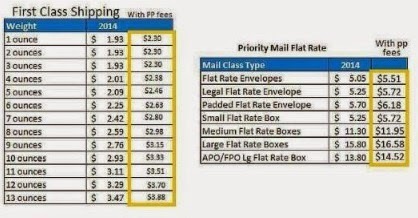 Anything you ship under 13 oz is considered 1st class mail. Anything over that is going to be considered Priority shipping. 1) A Kitchen Scale – I have this one. It’s the best selling one on Amazon. I’ve had great results with it. 2) Poly Mailer Bags – I have these from Amazon. 100 for $7 and Prime? I’ll take it. I’ve also bought them on eBay too. 3) Packing Tape – Don’t buy the $1 Store Tape – it’s not good. If you are over the 13 oz – select priority. 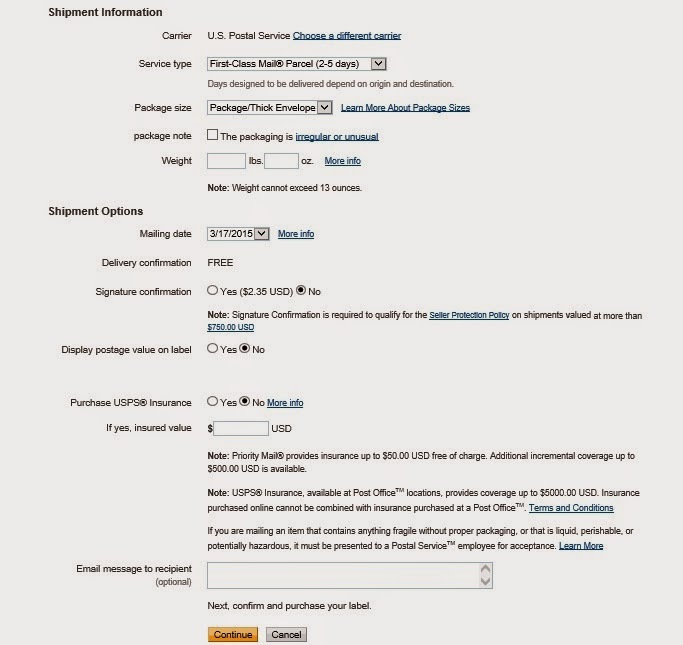 They will want you to enter the dimensions of the package you are shipping, but still cheaper than the PO! 1) If you are using the PayPal Invoicing System it automatically sends an email to your buyer with the tracking number. That keeps you accountable and it’s FREE. Yes – Delivery Confirmation is FREE! You have to pay for that at the PO. 2) All you have to do is once you print just slap the label on and pop it in your mailbox and the PO takes it from there. I’m amazed by the significant discount you get from mailing at home and how easy it is. 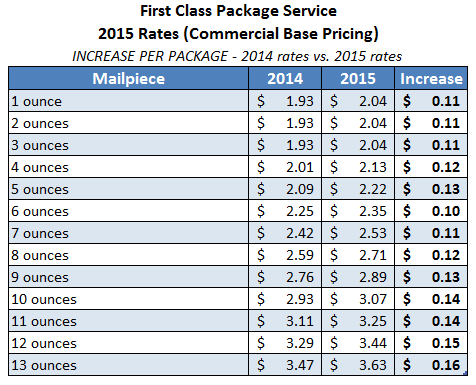 Below are the 2014 Online Rates. I can’t take credit for this chart, it is one I’ve used all year from one of the BST groups I belong to. 3) All tracking information is saved on your side too so you can track to see where things are. 4) If for some reason an item gets lost in transit or someone claims you never shipped something, all tracking and documentation is safe and sound in PayPal. In the event a claim is opened against you, you have the proof that you indeed do the work on your end. I can’t stress enough how much I love this CIA convenience. 5) If your printer is being wonky, you can reprint your postage for up to 24 hours. You can also cancel too if something happens or if you filled out the form wrong. Every time you attempt to print, it will give you the option to test print postage. I never do, but you certainly can! Any item you are shipping in a poly bag – DOUBLE BAG it. I’ve seen horror stories where an item gets stuck in the metal arms at the PO and an item is cut to shreds. Put that extra layer of protection in place. I personally go to the $1 store and buy the gallon zip top bags and then add them to the poly bag. I have lots of friends who put their items in a poly bag, close it and then use another poly – your choice. Fold your poly bag so it’s as snug as possible. I do this to insure that it again doesn’t get stuck in a machine. If there is floppy plastic, fold over for a tighter package and I always use extra packing tape. I hope this helps. If you have any questions, or need any clarification, please let me know! I know this is an area that everyone wants to save money, so I hope this will help you too! Shipping from home is the best! We ship all packages for both our businesses from home and our mailman picks them up. And if you have the option to use regional rate boxes, even better! They are bigger and cost less than flat rate most of the time!